Let me fill you in on a little secret: I hate listening to the radio. I am honestly surprised that in our world of super accessible music, public radio has not died out as a media form. Outside of tuning in to NPR or a sports broadcast, I see no reason to waste your time listening to the same 15 minutes of overplayed crap interspersed between a barrage of obnoxious commercials and humorless DJs. It is due to my disdain of the radio that I have grown to rely on the magic of mix tapes to fill the silence. Over the course of my life, I have made over 51 different CD mixes, all of which I have retained in some format. These discs of joy now serve as a catalog of my eclectic taste as it evolved from “music my parents enjoy” to “rebellious punk banter” to “heavy metal anger” to “whatever noise appeals to my aging ears.” Along the way, I have discovered that Nick Hornby was right; there is an exact science to the ebb and flow of a mix. One cannot just throw songs together on a compact disc and call it a day. The same delicate method should be applied when crafting the soundtrack to a rhythm game. The common path of a rhythm game is to allow the player to unlock increasingly difficult bundles of songs as he/she completes a previous tier to satisfaction. In video game circles, this is a tried and true method of game progression. A player should not feel overwhelmed by the options, and the game difficulty should rise as the player’s skill increases over time. But the rhythm game is a special creature, a wonderful mix of music and game that should stand somewhere between the two media; a hybrid of forms with all of the joy and none of the fluff. 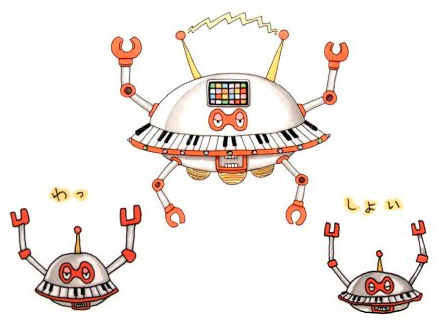 Since many of the newer rhythm games rely on previously released music for the soundtrack, it is difficult to establish the proper “mix tape flow” while offering the player enough content to remain engaged in the fantasy of being a rock/dance star. 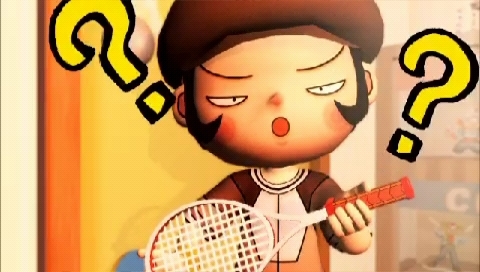 Older rhythm games often miss the flow by trying to fit the music around a story, or by limiting the soundtrack to one musical genre. But one strange little game came along in 2001 that managed to present an interesting plot with a solid soundtrack that makes for a great mix tape. 1st Track: Start off with some kind of an intro; a bit of a heads-up as to what sort of commitment the listener is getting into. A movie quote or piece of dialogue often works well. 2nd Track: Time to tap into the nostalgia fountain. Classic rock is great here – a catchy riff with memorable lyrics with which to sing along. This song should ease the listener into the mix. 3rd Track: Upbeat and fast paced music to get the blood pumping. A fun and odd song with high tempo, maybe some J-Pop or Euro-Techno; the sort of music to which one can exercise. 4th Track: Hmm, might have gone too far with the last track, time to scale things back a bit. Drop some funky jazz on the listener. A song with soul to calm the nerves. 5th Track: By now, they should be hooked, so toss in a throw-away song. Maybe some experimental house music or electronic reggae to mix things up. Chances are the listener will skip this track, so don’t agonize over the selection. 6th Track: The listener may be craving something deeper, more profound, so here comes the ballad. A wistful song, with the sort of vague emotion and ambiguous meaning that could be applied to any transitional period of life. Probably full of acoustic guitar. 7th Track: This should be the apex of the mix. A powerhouse song with a beat that will infect the listener’s every movement with a slight rhythm until he/she has no choice but to dance their heart out. 8th Track: Keep the dial on eleven as you drop in with a heavy metal powerhouse. Something over the top and filled with complexity that the listener will be left in awe of the raw talent on display. 9th Track: This may be the most difficult selection of the entire mix. You need to somehow tie together all of the emotion the listener has experienced, but present something new at the same time. Maybe a more empowered song from an earlier artist, to provide familiarity with a twist. 10th Track: The second to last song needs to be very intense; a sort of crescendo to the entire mix. Rapid guitar solos, rolling lyrics, maybe even overwhelming notes should be the focus of this track. 11th Track: The final track can be handled in two fashions. You can play a very wistful and emotive song to leave the listener in a contemplative mood. These sorts of songs are very dependent on the mood of the listener; end on a dour note and he/she may never want to hear the mix again. But if you close with a light-hearted tune, the kind of song that would be ideal at the end of a movie from the 90s, the listener will leave on a positive note, wanting to return to the mix for more joy in the future. Now you know the secret recipe to creating the perfect mix tape. Go forth and spread the good news: you no longer have to suffer under the tyranny of public radio. Gitaroo Man has once again saved the day! The nights were cold in the November of 2006. Despite a crisp wind in the air, students made their way from all over to crowd into a little basement apartment on the dark side of campus. The news had spread by word of mouth: good company, cheap drinks, and a free concert where all the classics would be played. Not a bad deal for a poor college kid. As they filtered in and warmed up with watered down cocktails, the students noticed something odd: the guitarist was not on stage with the rest of the band. He was casually standing with the crowd, beer in hand and axe slung over his shoulder. Even as the drummer counted in for the first song, the guitarist made no moves for the stage. He simply chugged the rest of his brew, adjusted his instrument, and began to play side-by-side with the crowd. It was unlike anything they had ever seen before: a concert where the crowd was part of the act. The setlist was entirely request-based, random party-goers could sing with the band, and the guitar was passed around for everyone to have a chance at stardom. While this scenario sounds like some sort of surreal concert experience, I am merely describing what could be one of a hundred different nights playing Guitar Hero at my apartment in college. Before the plastic guitars hit the scene, most exposure to rhythm games came in the form of Dance Dance Revolution and Karaoke Revolution. While these games sold well within niche markets, they lacked universal appeal for two main reasons. First, both game series appealed to limited musical markets. There was plenty of pop music, both American and Japanese, but that is about all the Revolutions had to offer. The second reason is the core gameplay is based on singing or dancing in front of a group. For players who are not blessed with a hefty mix of natural talent and coordination, performing well in these games may take weeks of practice, and even more time is required to feel comfortable playing in front of a crowd. 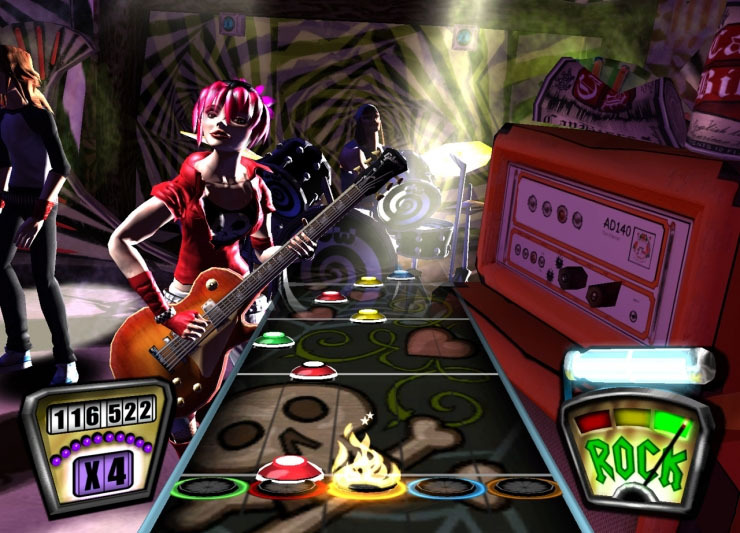 Guitar Hero hit a larger market by providing an easy-to-pick-up gameplay mechanic. This rock-star simulator did not test players on their natural singing abilities, or ask them to master the coordination of stepping on arrows along with fast-paced beats. Guitar Hero merely asked people to include a piece of plastic as they naturally played air guitar to their favorite rock songs. Making a guitar-shaped controller was also a brilliant move. 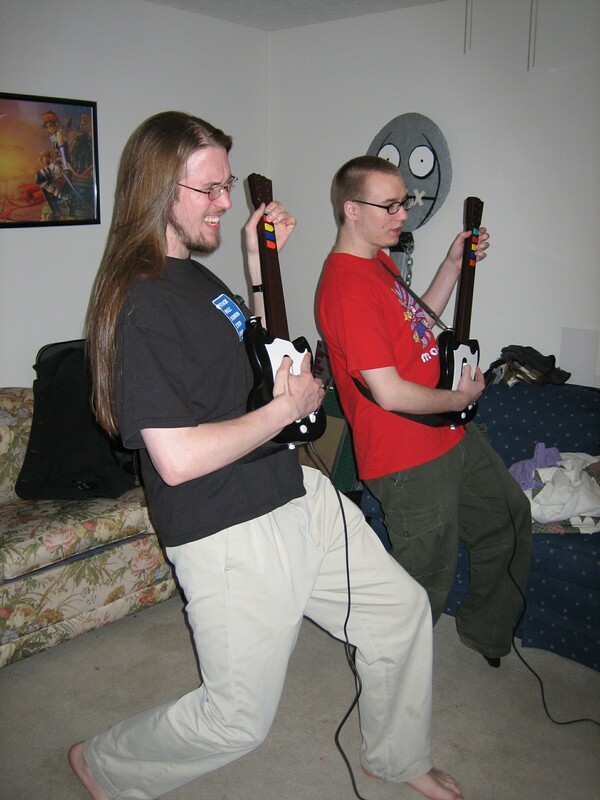 The tactile satisfaction of holding a guitar while strumming away at “More Than A Feeling,” dramatically throwing the neck of the instrument skyward to gain bonus points through a complex solo; the entire experience of playing Guitar Hero would be lost if the player had to translate their movements to a traditional controller. Developers at Harmonix took another step to ensure widespread appeal by dipping their cup into the deep, Eldritch well that is Rock Music. 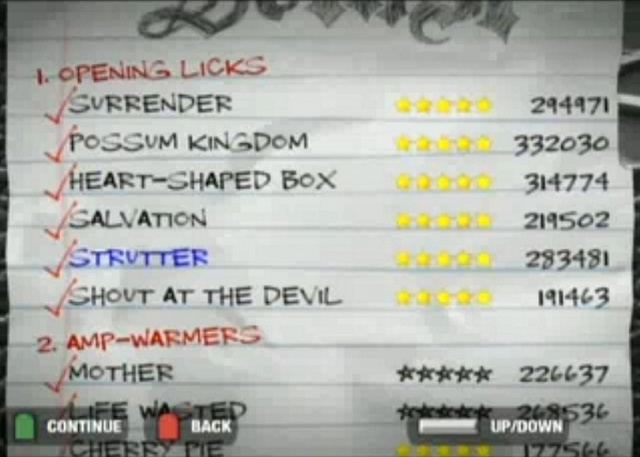 The setlist for Guitar Hero was an excellent mix of heavy metal monsters (“Bark at the Moon”), classic rock icons (“Smoke on the Water”), and even some more recently released popular songs (“Take Me Out”). For fans of that ole’ rock and roll music, there was plenty to offer. As the series continued into its fourth and fifth iterations, other instruments were added to the arsenal, and download content expanded the musical options exponentially. Unfortunately, like so many rock stars before it, Guitar Hero grew too massive, and collapsed under the weight of its success (and rampant drug use). Soon, every home had a set of plastic instruments to play with, so there was no need to buy a new little guitar or drum kit with each game release. As motion sensor controllers offered games like Dance Central and Just Dance to the market (without clunky instruments to clutter apartments), people began to ignore the once great Guitar Hero, and the series which filled every home (and college dorm room) with music faded to black. Despite so many people moving on from Guitar Hero’s rock offerings to the house-music style of Dance Central, I will never forget this fantastic game series and the happy memories it provided. 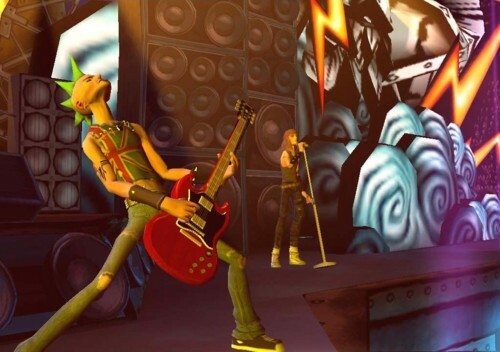 Besides being one of the very first games that Laura and I played together, Guitar Hero transformed my apartment in college from a den of nerd stylings into a hall of rock. After all, not everyone wants to come over and spend their Friday night playing video games; but everyone does want to come over and be a rock star. Especially if drinks are free. To start the new year on a strong video game note, Chip and I attended our first MAGfest (Music and Games Festival) together last weekend. 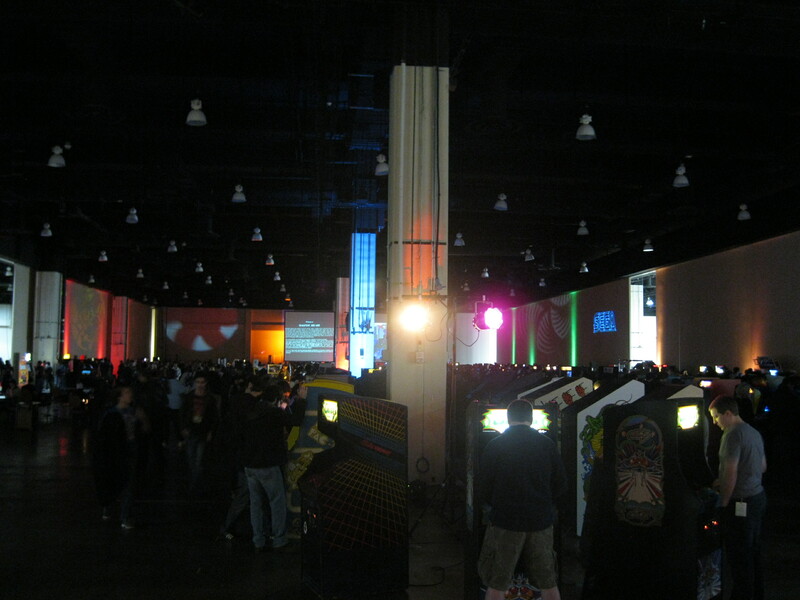 Apart from an excellent lineup of musical acts and entertaining panels, this convention boasts an impressive arcade set up. Nearly every kind of title you can imagine was available. From vintage arcade cabinets to pinball machines to numerous fighting games, all were free to play. Instead of overwhelming ourselves, darting back and forth between childhood favorites (most of which we could easily download from the Xbox Live Arcade), we decided to focus our attention on the pile of rhythm games we wouldn’t be able to play at home. Upon returning from MAGFest, we had a number of discussions about simulated dancing/drumming/guitar…ing, which inspired us to spend this month exploring the rhythm genre. One reason we chose to examine this particular genre here on GIMMGP is because these titles are by far and wide the easiest way to introduce a non-gamer to the world of video games. 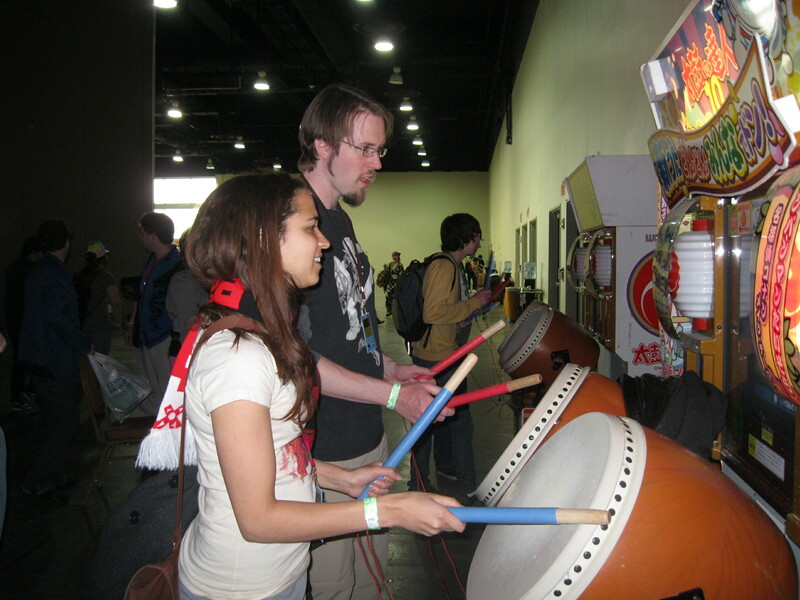 Rhythm games often feature intuitive controls and encourage group participation. Most people won’t play these types of games for nearly as long (or at all) if there isn’t anyone else around to share in the experience. It’s an awesome genre of gateway games that anyone can enjoy. Many of the games we will be covering are more common in arcade culture than at-home gaming, but we’ll look at some rhythm games available for mobile devices and consoles as well. So to get us started, here are a few suggestions worth checking out. Arcade culture isn’t as prevalent in Western society as it used to be, but it is definitely still around. For example, Dave & Buster’s has about 55 locations across the US. Most of the locations I’ve been to offer many of the games we are going to cover. While this option can become a little pricey, it’s still provides a great experience: rhythm games and alcohol, dancing and drinking. It’s like going to a club, but better because everyone is actually having fun. Between the iPhone and the 3DS, we have managed to acquire an impressive array of mobile rhythm games. If your girlfriend is looking for a way to share in your hobby, point her in this direction. These games are normally short and easy to learn. Be warned: if she doesn’t like them, it probably means she doesn’t like fun, so you shouldn’t be dating her anyways. Instrument Controllers: These games generally require use of accessories based on real-life instruments to play the game properly. Most likely you already own these items, or you know someone who isn’t playing theirs anymore that you can borrow. Traditional Controllers: Some of GIMMGP’s personal favorites are from back in the days before these new fangled gidgets and gadgets hit the market. These games were great fun and many are available for cheap download, check them out.